Southern magnolia (Magnolia grandiflora) is a native southern aristocrat that has become a blooming sensation over the past 30 years. The large 8 to 12 in. wide fragrant flowers appear in May and early June. Although they open sporadically and are often scattered haphazardly throughout the canopy, I’ve learned to appreciate each individual flower’s character and fragrance. I find the leaves to be attractive as well. The dark green, waxy leaves have the feel of plastic. The undersides of the leaves of the species are green, but some cultivars flaunt fuzzy, felty brown lower leaf surfaces. Closeup of flower of Kay Parris magnolia. Credit: Kevin Parris. Left to its own devices, a southern magnolia can attain gargantuan proportions, typically 60 to 80 ft. high and 30 to 50 ft. wide. 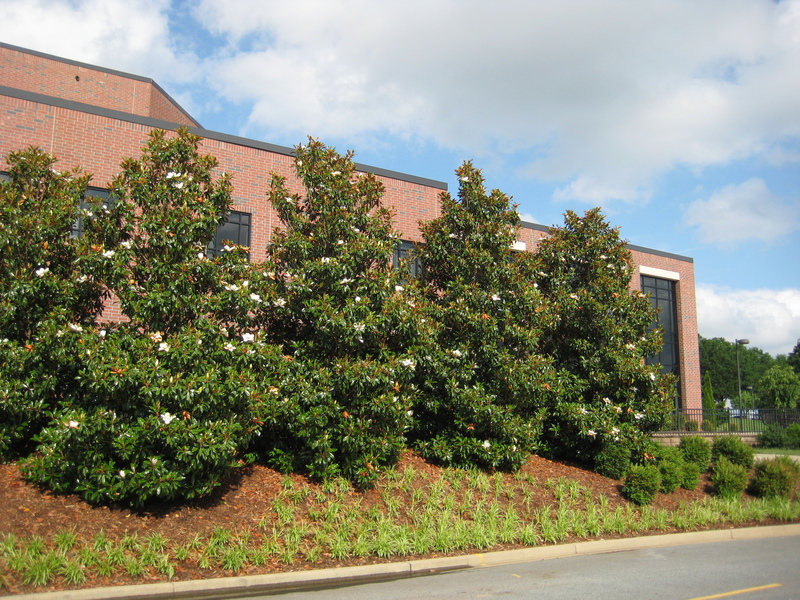 However, with the introduction and availability of cultivars that come in a variety of habits, sizes, and leaf shapes, southern magnolia can fit quite easily into smaller landscapes. Use the heat- and drought-tolerant cultivars as accents, or plant them in groups, hedges, or large screens. Kay Parris magnolia at Spartanburg Community College in SC. Credit: Kevin Parris. Several exceptional cultivars for the Carolinas include ‘Bracken’s Brown Beauty’, ‘Claudia Wannamaker’, ‘D.D. Blanchard,’ ‘Hasse’, ‘Kay Parris’, ‘Little Gem’, ‘Mgtig’ (Greenback®), ‘Southern Charm’ (Teddy Bear®), and ‘TMGH’ (Alta®). 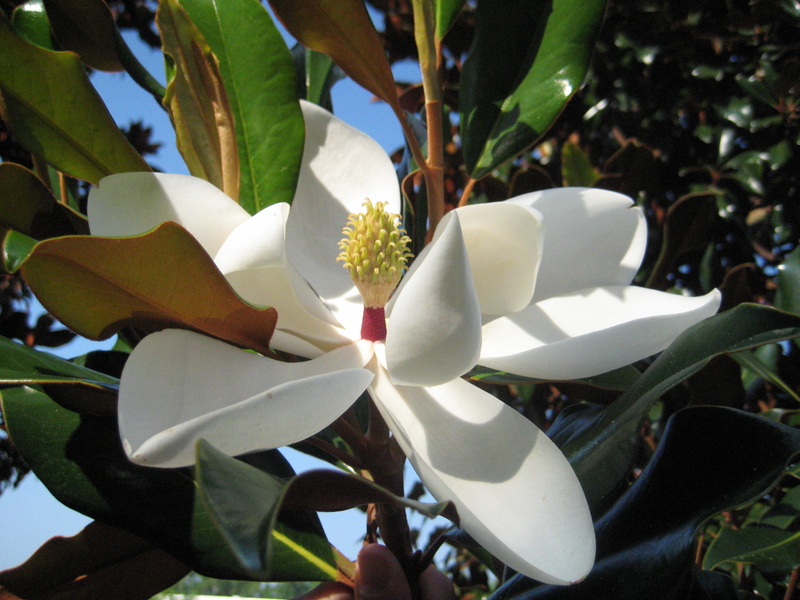 Note: Magnolia grandiflora ‘Kay Parris’ is an upright, columnar southern magnolia that bears six-inch wide fragrant flowers and grows up to 25-30 ft. tall and 10 to 12 ft. wide after 15 years. Introduced by Kevin Parris in 1993, it is believed to be the result of a cross between M.grandiflora ‘Little Gem’ and ‘M. grandiflora ‘Bracken’s Brown Beauty’. Say “Happy Mother’s Day” with wild-blue-indigo. Are you still wondering what to get Mom for Mother’s Day? I guess you’ve looked at the hydrangeas with their bowling ball-sized blue flowers. Maybe you’ve thought about roses but you got lost somewhere among the climbers, polyanthas, hybrid teas, and floribundas. The matching shovel and bow rake sounded great until you remembered how warmly Mom accepted the iron skillet you gave her last year. But wait. I’ve got an idea. If your Mom is new to gardening or was born with a trowel in her hand, wild or false indigo (Baptisia species) may be the plant for her. This herbaceous perennial is native to the Southeast and has been a part of southern culture since the 18th and 19th centuries. The blue-flowered form (Baptisia australis) was cultivated widely in the south and was used to make dye for the growing textile industry in Georgia and South Carolina. Allan Armitage, a professor at the University of Georgia and author of Herbaceous Perennial Plants wrote that when the true indigo, Indigofera, was in short supply in the mid 1700s, Georgia and South Carolina farmers were contracted by the English government to “farm” wild blue indigo. Wild indigo is blooming right now, bearing spikes of pealike flowers that rise above the gray-green, three-lobed leaves. Depending on the variety, wild indigo flowers come in deep blue to yellow (B. tinctoria) or creamy white (B. bracteata). The flowers give rise to black seed pods that remain for most of the summer. Wild indigo flowers best in a well-drained location in full sun. 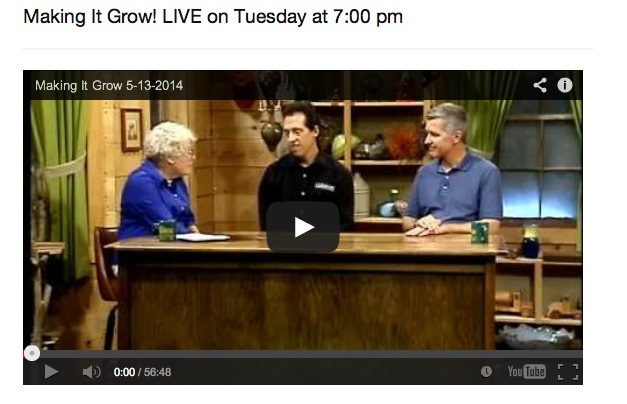 Give this plant plenty of elbow room. It can reach up to 3 or 4 feet in height with an equal spread. I cut back the top after it flowers to prevent it from encroaching in the personal space of its neighbors. Wild indigo is a clump-forming herbaceous perennial that slowly spreads outwardly. So, every second or third fall you can divide your Mom’s clump of wild indigo and move it to your own garden. (Now, you can’t say that about many Mother’s Day gifts.) It produces a deep taproot, so bring a sharp spade along and a little patience. Besides its leaves and flowers, I love Baptisia for its ruggedness. It’s a great “starter” plant for new gardeners because wild indigo quickly recovers from any mistakes. For example, my six-year-old son harvested all of the new shoots as they poked through its mulch blanket in mid-April. He thought that if the shoots looked like asparagus, they must be asparagus. I was mortified when I saw him carrying an armful of wild indigo shoots in his arms and a beaming smile on his face. No problem. The wild indigo responded by producing more asaparaguslike shoots that bloomed magnificently. Then there was the time when I cut back my Purple Smoke Baptisia (a cross between white and blue indigo) to 4 to 6 inch high stubs two years in a row in mid-July. It was one of my “let’s-see-what-happens” experiments. Each spring Purple Smoke indigo returned looking as lovely as ever. Well, you may not want to use those exact words. But you can’t go wrong by calling Mom and wild indigo “beautiful.” Happy Mother’s Day!